Brighton Cafe: Tusk Mocks May on Instagram. Is this the New Normal On Social Media and What are the Consequences? 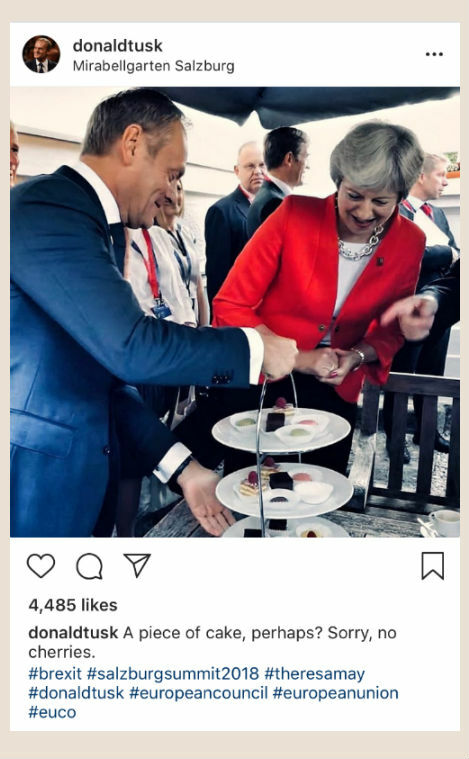 Tusk Mocks May on Instagram. Is this the New Normal On Social Media and What are the Consequences? 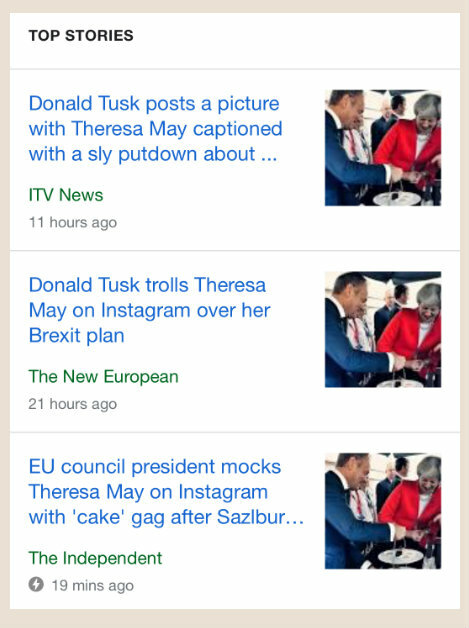 Yesterday evening Donald Tusk, President of the European Council, posted a picture on Instagram mocking Theresa May, the UK Prime Minister. We are used to Donald Trump using Twitter to mock his opponents, such as his 'rocket man' tweets referring to North Korean president Kim Jong Un. Unfortunately it now appears to be increasingly common for politicians to use social media to mock the opposition and make personal attacks on opponents. What are the consequences of this behaviour for politics? Below is the post from Donald Tusk. The post refers to the alleged 'cherrypicking' of May's proposal that the UK stays in the single market for goods but not services. It appears this post was planned in advance. The Independent reports that during the summit "Donald Tusk ushered the Prime Minister over to a strategically positioned tray of cakes and offered her a morsel to eat. It was only after the closing of proceedings that it became clear that the former Polish prime minister had something else in mind than Ms May’s appetite." In social media terms the post was mild. However, it appears to me that mocking aims to elevate the status of the mocker and undermine the person being mocked. When there is an audience, as in this case, mockery is also used to bolster the status of the mocker. It almost creates a parent child relationship, I have so much power and authority that I can mock you. The British press were quick to pick up on the Instagram post and its intentions. My concern is that mockery can be perceived as ridicule, derision and contempt. Thus such posts, even if intended to be amusing, create emotional reactions which can further polarise opinion. I feel Tusk made a mistake on this occasion and one which will further entrench the way Leavers in the UK see the EU. Just five hours after I wrote this post a visibly angry Theresa May gave a televised speech to the nation demanding respect from the EU. Clearly Brexit has a great many difficulties and frustrations but I do wonder how much of her emotional reaction had to do with being mocked on social media.